This quilt definitely wasn't planned, but sometimes, when life hands you not-matching lemons, you grab a sharpie and a glass of tasty booze and say, "Fine, how can I make this work?" Well, it didn't really happen like that. If you read "But it's awesome when it happens!" then you know the story: the tale of two pinks that didn't work together, and the call to Margo at reproductionfabrics.com to say ACK SAVE ME PLZ. With a small application of my credit card, fabrics were acquired. 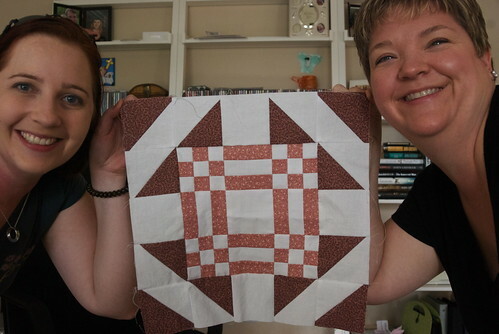 Wait ... we need two people to hold this square! The cinnamon pink will be happier here. When placed next to the purple, it looks soft and lovely instead of the poor drabby brownness it had next to the ultra-poppy pinks in Lucy. Everyone goes home happier in this configuration. Since I'd already cut into the fabric, I was committed to this design, so I went hunting for a way to make it slightly different. 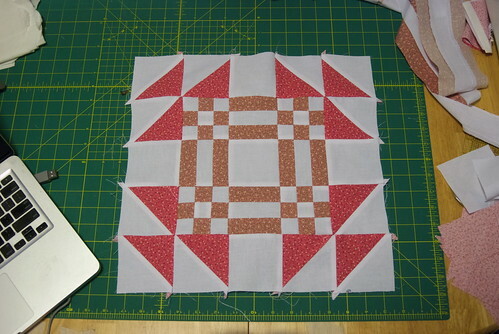 There are several variations of the 'goose in the pond' block that involve swapping the outer triangles out in different directions, and I've decided to use one of the variations instead of making the same exact quilt twice. I've confirmed with Rick and Jessica (of geekking.com) that these are indeed their older daughter Phoebe's favorite colors, so this will be a late 3rd birthday present for Miss Phoebe. Rick told me tonight that the girls will end up with twin beds, so -- hooray! 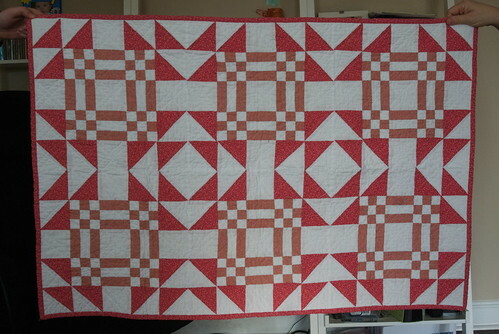 -- this will be a slightly smaller-than-usual quilt for me. 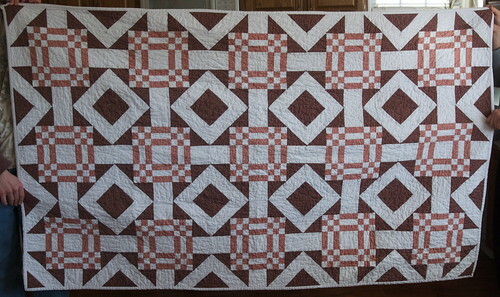 I'm NOT going to argue if someone says "Noooo, you don't have to do a queen-sized quilt!" But first, I have to wrap up a few other things...I'm grateful they're not expecting it immediately. I'm trying to bang out a few quick projects, and those are taking priority over everything else until they're done.